Fosse, with a capital F, means one of Broadway’s supreme choreographers. With a lower-case f, it is a castle moat or a long and narrow ditch. The contrivers of the show Fosse have usurped that capital F for their lowercase venture. 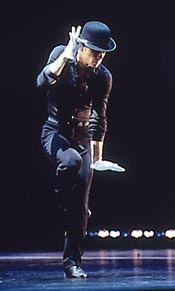 This long and narrow spectacle that came to praise Bob Fosse is more likely to bury him. That, of course, is not how the insiders see it but how it strikes my outsider’s eyes. Some reviewers have agonized over how to explain what went wrong. Let me count the ways in which this spectacle, many years in the planning, almost had to miss the mark. Chet Walker conceived it and re-created the choreography; Richard Maltby Jr. (of Ain’t Misbehavin’ fame) is the director; Ann Reinking, one of Fosse’s muses, is co-director and co-choreographer. Another muse, Fosse’s widow, Gwen Verdon, was artistic adviser. So many cooks can imperil any brew. (1) It was decided to forgo any biographical, historical, or narrative ordering. (2) There is no thematic sequence either, though that, admittedly, would be hard to come by. (3) There is no context, no explanation. The program does give you some help, but what you read ahead of time doesn’t stick while you are watching; what you try to read during the show makes you miss things onstage and disturbs your neighbors. (4) A more serious problem: Despite Fosse’s immense talent, there is not enough variety here. Fosse’s signature devices – the prestidigitated-with bowlers, the centripetally turned-in toes and centrifugally splayed hands, the provocatively soliciting posteriors both male and female – sexually revolutionized Broadway dancing but insistently heaped-on, cause monotony. The obvious comparison is with Jerome Robbins’ Broadway, itself only a moderate success. But, unlike Fosse, Robbins had the benefit of ballet training, doubling his vocabulary. (5) Robbins had one further advantage: He was alive and in charge. However knowledgeable and dedicated the co-conceivers may be, they are not the man himself. (6) Copying is not the same as creating. Assemble a team of leading contemporary painters well versed in art history, set them to making Vermeers, and the results will be dubious. (7) Presumably to save money, the original sets and costumes were not re-created. Santo Loquasto has come up with nice substitutes for the real things, but it is too much to expect from one designer to find uncostly equivalents for the work of many major, financially unfettered talents. The unhappy smell of compromise cannot be exorcised. 8) The cast of Fosse is technically accomplished and works as hard as Sisyphus. But I do not discern star quality in anyone; a certain potential, perhaps – the achieved thing, no. (9) Possibly parts of this show interspersed with the book of a musical and with singing (there is a token amount of the latter here) would be sufficient. Isolated from or partly deprived of these necessaries, the remnant is too much of a muchness. Or littleness.